, a very ingenious artist, in the modelling department, was born in the neighbourhood of Glasgow, of obscure parents, and began life as a country | stonemason, without the expectation of ever rising higher. Going to Glasgow on a fair-day, to enjoy himself with his companions, at the time when the Foulis’s were attempting to establish an academy for the fine arts in that city, he saw their collection of paintings, and felt an irresistible im^ pulse to become a painter. He accordingly removed to Glasgow; and in the academy acquired a knowledge of drawing, which unfolded and improved his natural taste. He was frugal, industrious, and persevering; but he was poor, and was under the necessity of devoting himself to stone-cutting for his support; not without the hopes that he might one day be a statuary if he could not be a painter. 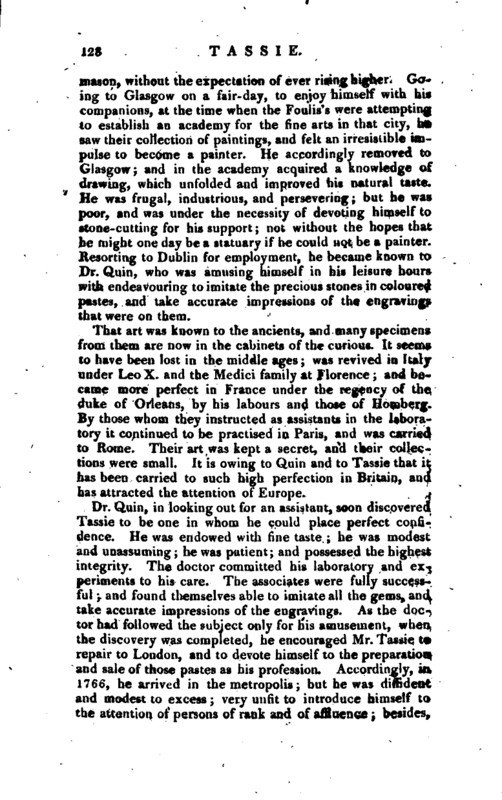 Resorting to Dublin for employment, he became known to Dr. Quin, who was amusing himself in his leisure hours with endeavouring to imitate the precious stones in coloured pastes, and take accurate impressions of the engravings that were on them. That art was known to the ancients, and many specimens from them are now in the cabinets of the curious. It seems to have been lost in the middle ages; was revived in Italy under LeoX. and the Medici family at Florence; and became more perfect in France under the regency of the duke of Orleans, by his labours and those of Homberg. By those whom they instructed as assistants in the laboratory it continued to be practised in Paris, and was carried to Rome. Their art was kept a secret, and their collections were small. It is owing to Quin and to Tassie that it has been carried to such high perfection in Britain, and has attracted the attention of Europe. Dr. Quin, in looking out for an assistant, soon discovered Tassie to be one in whom he could place perfect confidence. He was endowed with fine taste; he was modest and unassuming; he was patient; and possessed the highest integrity. The doctor committed his laboratory and experiments to his care. The associates were fully successful and found themselves able to imitate all the gems, and take accurate impressions of the engravings. 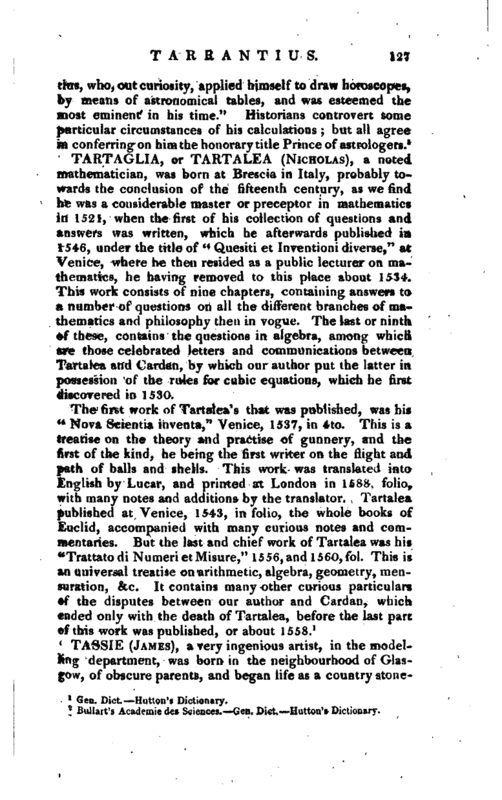 As the doctor had followed the subject only for his amusement, when the discovery was completed, he encouraged Mr. Tassie to repair to London, and to devote himself to the preparation and sale of those pastes as his profession. Accordingly, m 1766, he arrived in the metropolis; but he was diffident and modest to excess; very unfit to introduce himself to the attention of persons of rank and of affluence; besides, | the number of engraved gems in Britain was small; and those few were little noticed. He long struggled under difficulties which would have discouraged any one who was not possessed or' the greatest patience, and the warmest attachment to the subject. 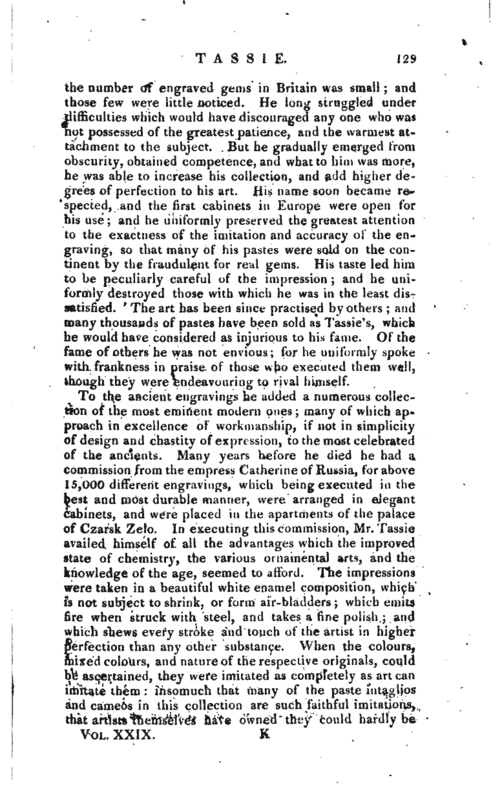 But he ^gradually emerged from obscurity, obtained competence, and what to him was more, he was able to increase his collection, and add higher degrees of perfection to his art. His name soon became respected, and the first cabinets in Europe were open for his use; and he uniformly preserved the greatest attention to the exactness of the imitation and accuracy of the engraving, so that many of his pastes were sold on the continent by the fraudulent for real gems. His taste led him to be peculiarly careful of the impression and he uniformly destroyed those with which he was in the least dissatisfied. 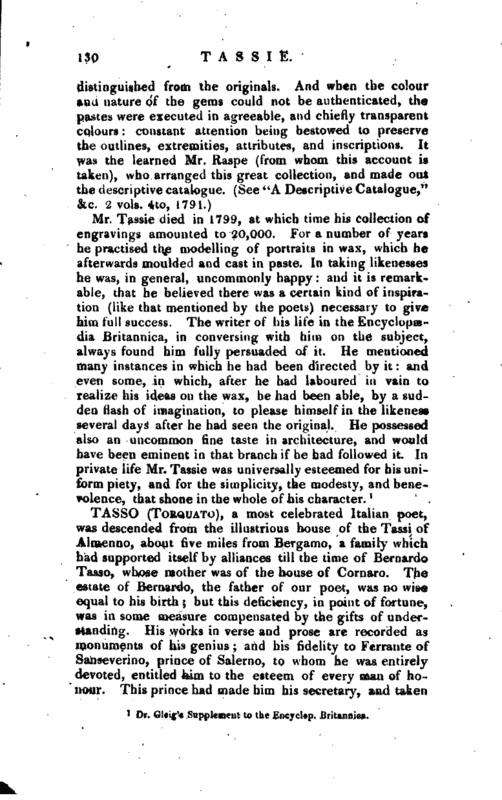 The art has been since practised by others; anci many thousauds of pastes have been sold as Tassie’s, which he would have considered as injurious to his fame. Of the fame of others he was not envious; for he uniformly spoke with frankness in praise of those who executed them well, though they were endeavouring to rival himself.